This web site is for informational and promotional purposes only. The Berea Fine Arts Club, Inc. and its employees, club members, committee members, consultants, and volunteers shall not be responsible for errors in content or any outcome resulting from your use of this information. 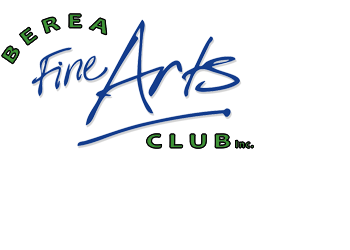 The Berea Fine Arts Club, Inc. web site may contain links to external third-party web sites (such as artist web sites) not maintained by or under the control of our organization. The addresses and content of these external web sites may change, thus The Berea Fine Arts Club, Inc. does not endorse or accept any responsibility for their content or use. Unless otherwise specified all content is the exclusive copyright of The Berea Fine Arts Club, Inc. and/or its member artists and may not be copied or distributed without the written consent of the artist and organization representative. Any information submitted through this site for contact purposes (name, e-mail address, phone number, or any other personal information) is used solely to respond to and fulfill your request and is not shared outside of our organization and/or membership base.